Nordstrom Triple Points and 50+ Free Gifts! As part of this promo, Nordstrom has a ton of new gift with purchase offers. Notably, there’s a Lancome one, Charlotte Tilbury, Fresh Cosmetics, Jo Malone London, Space.NK apothecary, Jane Iredale, Glam Glow and more. You can see all of the brands participating here. 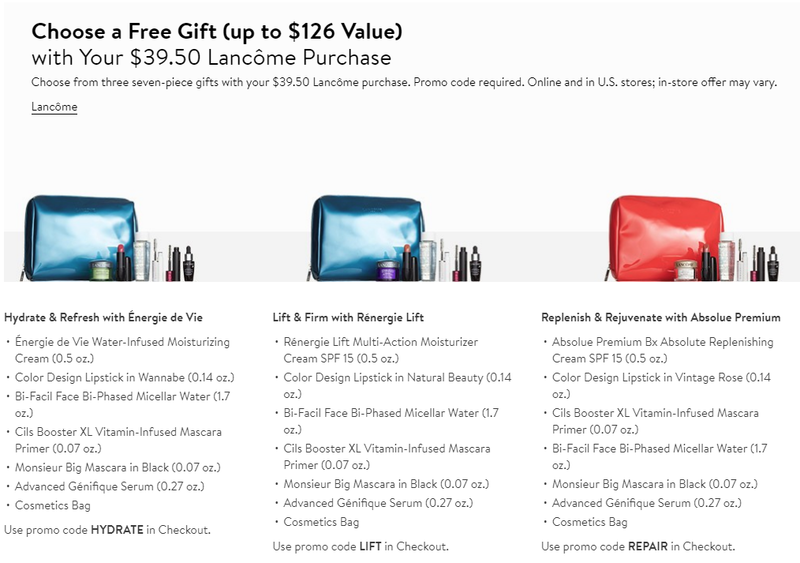 There are 3 different 7-piece Lancome gifts to choose from with a $39.50 Lancome purchase. You’ll use one of the following promo codes at checkout to choose your gift: HYDRATE, LIFT or REPAIR. There is also a step up gift at the $75 level. Spend $75 on Lancôme and also receive La Base Pro Perfecting Makeup Primer (0.24 oz. ), Matte Shaker High Pigment Liquid Lipstick in Pink Power (0.36 oz.) and a Blush Subtil Palette in Rose Flush (0.08 oz.). Up to $168 combined value.